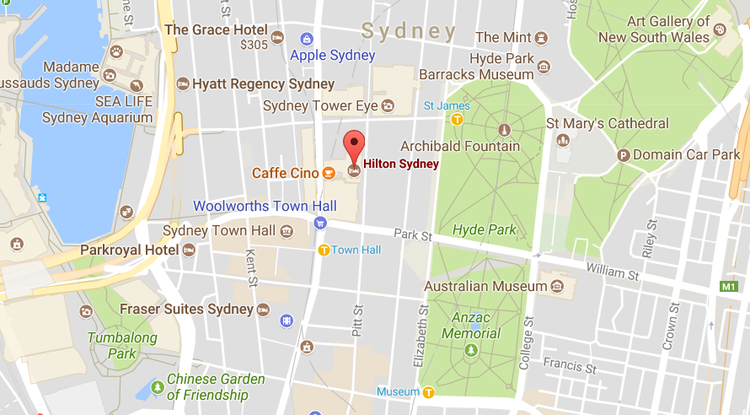 The Hilton Sydney hotel is located right in the heart of the Sydney CBD on George Street, only 30 minutes from Sydney International and Domestic airports and only 50m from Town Hall Station. For a stairless entry to the Hilton Sydney, please enter via 255 Pitt Street and take the lift up to Level 3 where the registration desk and plenary room will be located. Due to one way road systems on George Street, please note that car access to Sydney Hilton is via Pitt Street only. Please program 255 Pitt Street if using a car navigational device.There is a secure underground car park located at Hilton Sydney. This carpark is owned and managed by Secure Parking. Self parking fee is $57.50 for 24 hours from time of entry. Hilton Valet Parking is available ($81 for 24 hours) or enter the carpark directly and Secure will park the car for you at casual parking rates. Continue on the M4 Tollway, merging into Parramatta Road, continue through Broadway, staying in your right lane and veering right onto Pitt Street. Follow Pitt Street for a few blocks and after crossing Park St, the hotels driveway will be located approximately 50 meters further down on your left-hand side. Enter via the Sydney Harbour Bridge, following the Western Distributor, take the exit towards City South/Darling Harbour. Make a left turn onto Bathurst Street, drive across George Street and make another left turn onto Pitt Street. Continue down Pitt Street, drive across Park Street and within 50 metres the hotel driveway, valet parking and car park are located on the left hand side. From Sydney Airport, taxis are available to take you directly to the Hilton Sydney hotel. The journey normally takes around 40 minutes and costs approximately $60-$65. As an environmentally friendly Symposium with a focus on sustainability we recommend you take the Train for direct, convenient access to the hotel from the airport and most other locations.There is a Train Station located at both the Sydney Domestic and International Airports with a direct line to the city. Exit the train at Town Hall Station and the Hilton Sydney hotel is located adjacent to the Victoria Galleries, entry via Pitt Street or George Street, Travelling time is around 25 minutes and costs approximately $17 per adult each way.